Food and Nutrition Newby P.K. From cleanses and raw veganism to the clean eating and paleo diets, it seems that every day there is news about some new super-nutrient, super diet, or super food that promises to help us to be healthier, smarter, happier, fight disease, lose weight, or live longer. Some of this information propels temporary food or diet fads, some of it is subsequently discredited, and some becomes staid wisdom of healthy eating. It structures the way we eat and consume, the research agendas of food scientists, and the ways in which food companies market their products, and therefore the ways in which the global food system is built. It also affects the environment, food and animal ethics, political and social movements, public policy, and, of course, our health. 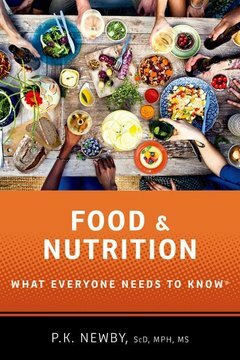 Food and Nutrition: What Everyone Needs to Know® looks at food systems globally and historically to explain how food production, diets, and nutrition science have changed across time. It will begin with chapters on contemporary diets and nutritional problems, food revolutions (from the birth of agriculture to genetic food technologies), basic concepts in nutrition science, food choices and the evolution of human taste preferences, the politics of food environments, modern food production and its effects on human health, and the environmental costs of food production. The book will then dive into the nutrition and ethics of animal-based diets, beverages, plant-based diets, nutrition guidelines and food labels, and food technologies. Ultimately this book provides an overview of the contemporary relationship between humans, land, and food, and explores the sustainability of consumption patterns on our health. PK Newby is Adjunct Associate Professor of Nutrition at Harvard University. She is the author of Superfoods: Eat Your Way to Health and Longevity and Foods for Health: Choose and Use the Very Best Foods for Your Family and Our Planet.